January is here and so are we. Winter is not the end of times, just the end of warm times. That's not even true - as I type it is over 40ºF outside. All the snow we got earlier in the week is in the process of melting away. Temporarily, I'm sure. Well, enough small talk, time to type and see what happens! I have back issues. I've had two surgeries on my lower back so far and at this rate there's at least one more in my future. I do my exercises every morning but I still have days where I just don't want to move - or sit still, nothing is comfortable. Recently it has been very uncomfortable and I've missed some work. All I can do is keep on carrying on and try to keep it as best I can, until I can't. Everybody has something and this is the monkey on my back, so to speak. Sigh. Before the holidays I noticed a little leak downstairs when we ran the dishwasher. It took some time, but the problem was finally diagnosed and it was not good. The repair would cost almost as much as we spent on the dishwasher less than 6 years ago. We didn't even consider repairing it and ordered a new one, hopefully a better one. We took some advice from the repairman and have the new dishwasher ordered for delivery and installation in a few weeks. The leak is too bad to run the current dishwasher anymore so until the new one is installed we have to hand wash everything. Good times. First world problem, right? When I was off work the other day I thought I would run past Ella's Deli right when they opened at 11 am. I was thinking I could get some pictures before they got busy. I grossly underestimated the local sentiment for the restaurant. When I drove over I went straight past as the parking lot was full and they were lined up out to the street waiting to get in. I was hoping to stop one last time before they close for good tomorrow, but I'm not willing to fight the crowds to do it. I'll cherish the memories I have of this Madison institution - and there's tons of pictures already on google images. I guess I can't think of much more to say right now, so just a short one. Tonight we are going out to dinner, celebrating my wife's birthday at another great local restaurant, Cafe La Bellitalia. Probably the best Italian restaurant that we've found in the area. Just with friends Terry and Becky this year. I'm understanding more how a winter birthday is unfortunate, and it happens every single year. I must admit, summer birthdays seem more fun. No matter what, it's still your birthday. Happy birthday, Kate! We got our first significant snowfall for the season today. 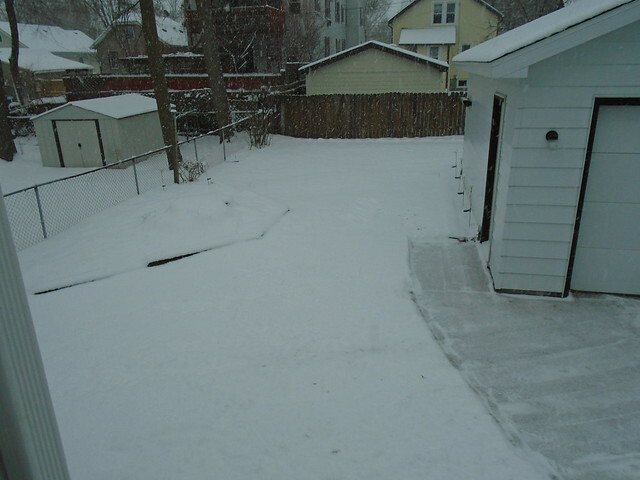 Prior to this we'd only had a few snowfalls of an inch or two, and as of yesterday we had no snow cover left on the ground at all. Yesterday afternoon it started with a few flurries, it was a light layer by bedtime, and we woke up to several inches this morning. It has continued to snow much of the day today and as of now we have a snow shower stuck overhead that just keeps dumping on us. This picture was taken about a half hour ago, before it got too dark out. I had gotten home and (after several tries) fired up the snow thrower and spent the next half hour clearing the driveway and walks. I hadn't had to do that since last year - and I do not miss it. When all is said and done we were projected to be in the 5-6 inch range, and that may be about right as long as it finishes sometime soon tonight. Not a whole lot has been happening otherwise. We've had dishwasher issues, but I may write about that later after the (expensive) new one is delivered in a few weeks or just include the topic in a future This-And-Thats post. 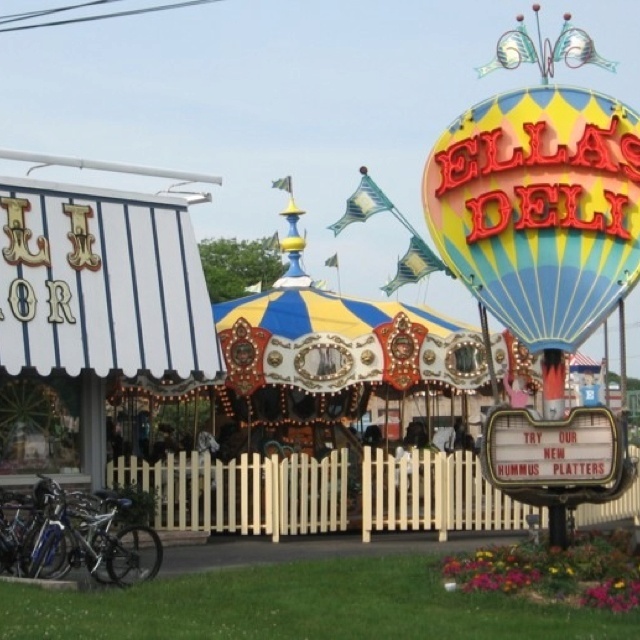 Ella's Deli is slated to close after 42 years on or about January 21st. I've posted about this local landmark restaurant before, and we hope to get there some night this week before it closes for good. It's a very interesting place, and (summer) walking distance from home. I don't want to jinx myself, but it would be nice to get there for dinner this week and take some good pictures to share before it fades into Madison history. 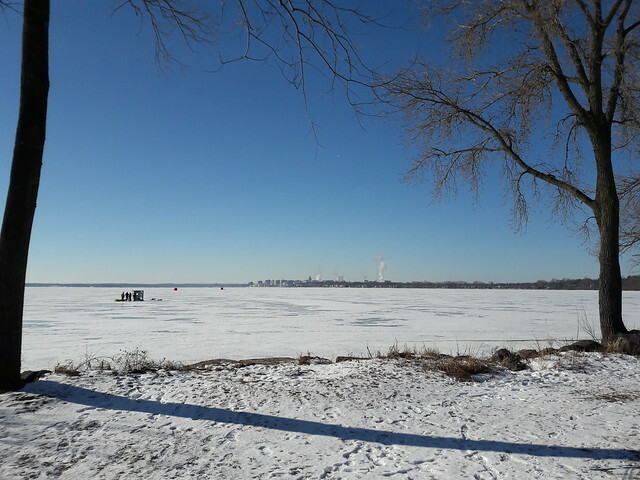 Three weeks ago I pulled off to take some pictures of the Lake Monona ice during a beautiful late fall day with temperatures above freezing, link here. Since then the weather has turned a bit even before the season officially changed to winter. We've been in a deep freeze, nothing we can't deal with and not as cold as we've seen at its worst, but for a full two weeks now our low temperatures have gotten below 0ºF every night with highs in the single digits and maybe the teens if we got lucky. That's a lot of cold weather. These were taken from the same place I stopped 3 weeks ago, the site of the Olbrich Biergarten. Since then we've had a few light snowfalls, aside from the cold Canadian air that keeps diving south. The temperature at this time today is about 5ºF (-15ºC). Facing off to the left, south, there is no longer any open water and no water fowl in sight. We have frost forming on the concrete in a top corner of the basement, the humidifier is on maximum, and we've been cheating the thermostat higher than set every day, but overall there's been few issues for us personally, due to the cold. 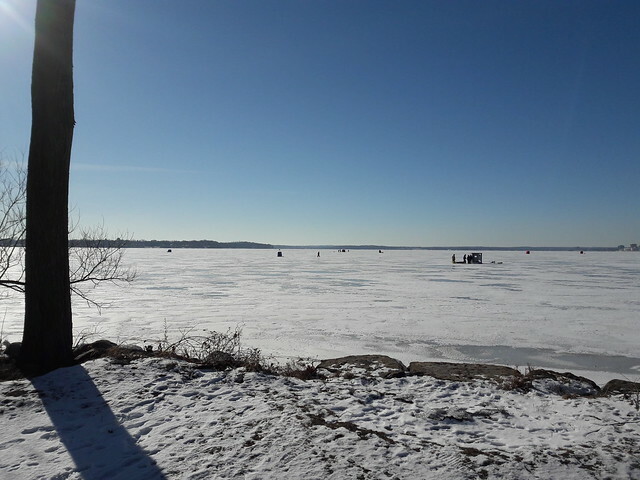 As I turn to my right you start to see all the ice fisherman that have taken up residence on this part of the lake. Across the city there have been water mains freezing every day, pavement has buckled due to the cold on the highways causing multi-car accidents, and at least 3 local deaths due to the cold. 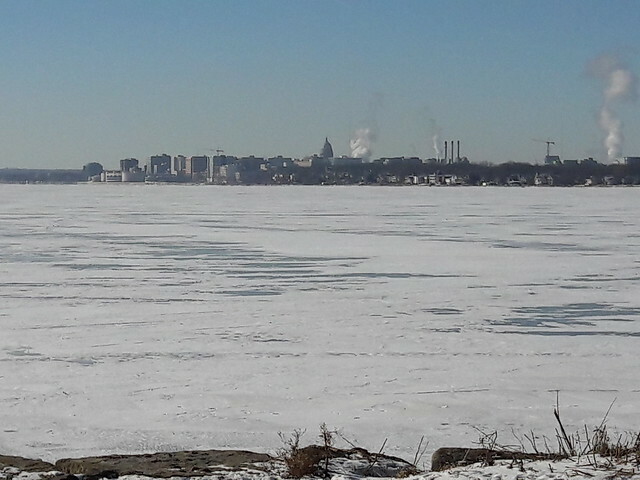 Again with the ice fisherman, the isthmus in the background. The good news is that starting tomorrow we get warmer, back up to where we should be normally and even a little more. 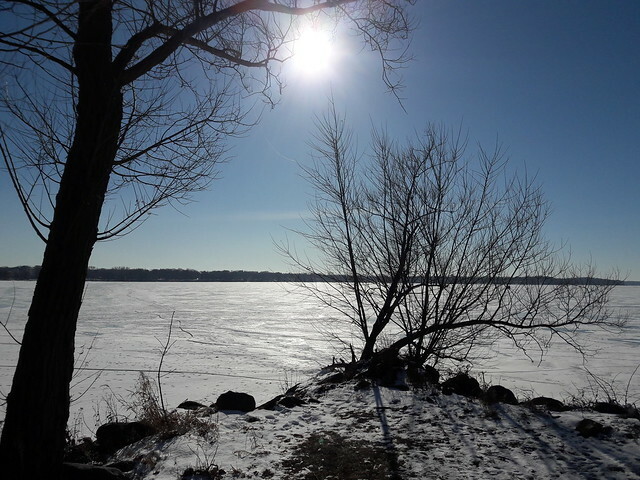 Highs this coming week are expected to be around the freezing mark, 32ºF (0ºC), thankfully. I'll finish with the usual, a view of the State Capitol on the downtown isthmus.